We building beautiful, functional, boulder retaining walls. There are many areas being developed in the Qualicum and Parksville area that aren’t nice flat land. Many of these new developments are being built on hillsides and uneven terrain which in many situations, need properly built retaining walls to enhance both the look and function of the landscape. Beaudry’s Bobcat & Septic Service is a Qualicum Beach based excavation contractor that has been serving the local area since 2007. We specialize in building retaining walls out of large rocks and boulders or concrete gravity blocks that we can move and place with one of our machines. While retaining walls are designed and built to hold back earth and fill they will also hold back and channel water. The water that builds up behind a retaining wall is referred to as “hydrostatic pressure” and the external force of the material/fill held behind your wall coupled with the weight of the water is often enough to seriously compromise the integrity of your wall and even cause failure and collapse of a poorly engineered wall. A good drainage system should be an integral part of any retaining wall design. Depending on the type of material being used to build the wall there are a variety of ways to integrate sufficient drainage, such as weep holes, lateral drains, blanket drains and also the use of very granular soil or fill behind and below the wall. Why Choose Beaudry’s For Your Boulder Retaining Wall Project? 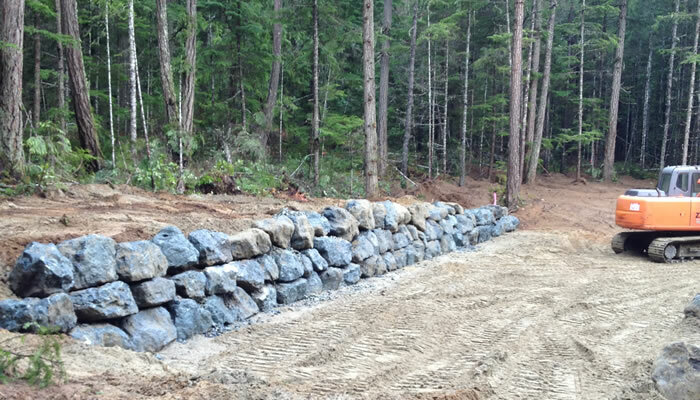 When you choose Beaudry’s Bobcat & Septic for your retaining wall project you are partnering with a small local business that has been serving the Qualicum Beach area for the last 10 years. Our goal is provide you with a beautiful retaining wall solution that will stand the test of time. We rely on our word of mouth advertising from happy clients for our business to grow and your project will be treated with the utmost of attention and care so you’ll be just as happy with our work! If you’d like to receive a Free Estimate for your boulder retaining wall please give us a call (250) 240-4596 or fill out our contact form and we’ll get right back to you.